Marketing has one job and that is to reach consumers at the moments that most influence their decisions, these are known as touchpoints. Touchpoints are anytime a potential or existing customer comes in contact with your brand, before, during or after their purchase. Touchpoints can include your website, retail stores, and social media. Every single touchpoint presents a valuable opportunity to engage with your customers, listen to what they have to say and use their feedback in order to optimize your customer journey. The number of touchpoints can be endless but it doesn’t have to feel endless. Actually, by automatizing work processes with Enalyzer and Zapier, you can optimize your entire customer journey and deliver better customer experience. It will also make your job as a marketer easier – what’s not to like? You can’t improve your customer journey if you don’t have a holistic idea of how your customers are experiencing your brand at every touchpoint. With Enalyzer, you can collect and analyze customer feedback, helping you know better and make better decisions to improve customer experience. Zapier is a web automation tool that connects Enalyzer with 1000+ apps. This means you can connect Enalyzer with the apps you use every day to connect with your customers. Use Enalyzer and Zapier to automize your customer touchpoints. 1. Initial consideration: the consumer considers an initial set of brands based on brand perceptions and exposure to recent touch points. 2. Active evaluation: the consumer participates in active evaluation where they add or subtract brands as they evaluate what they want. 3. Brand selection: involves the moment of purchase where the consumer selects a brand. 4. Post-purchase experience: the consumer evaluates their post-purchase experience, the consumer builds expectations base on experience to inform the next decision journey. 5. 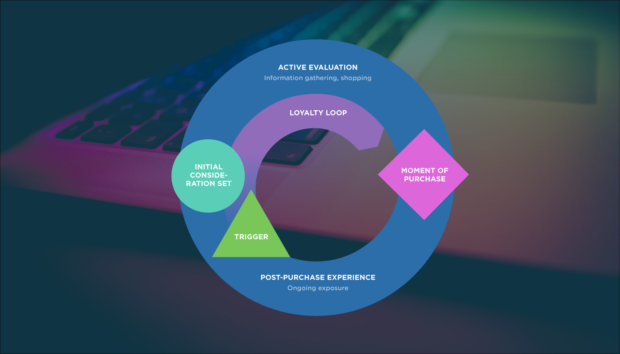 Loyalty loop: if the post-purchase experience is positive there is a high probability for the consumers to enter the loyalty loop. 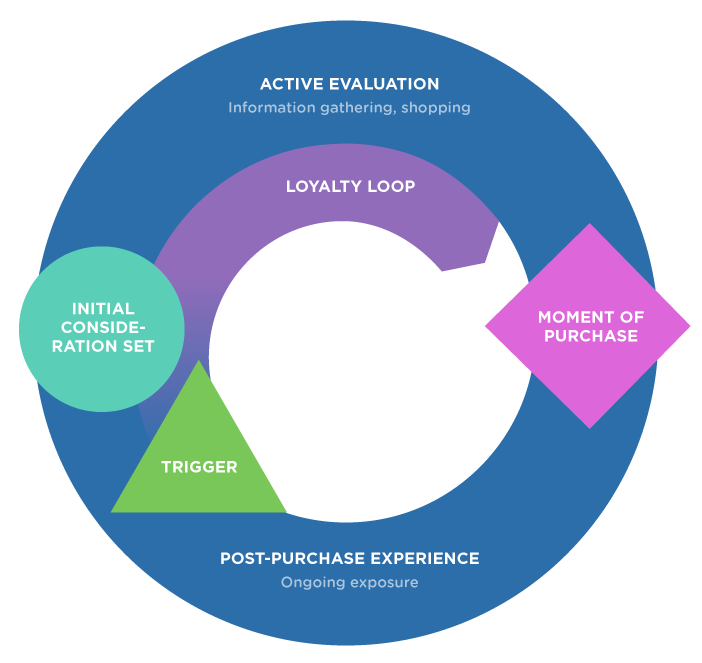 Once loyalty is achieved, the consumer enters the circular model and goes straight to stage 3 – the moment of purchase. As with everything else, marketing has developed, advanced and become more complex. One of the strengths of the consumer decision journey is that it tailors to any geographic market that has different kinds of media, internet access, and wide product choice. A great way to increase brand awareness is to deliver free content and build a relationship with potential customers. 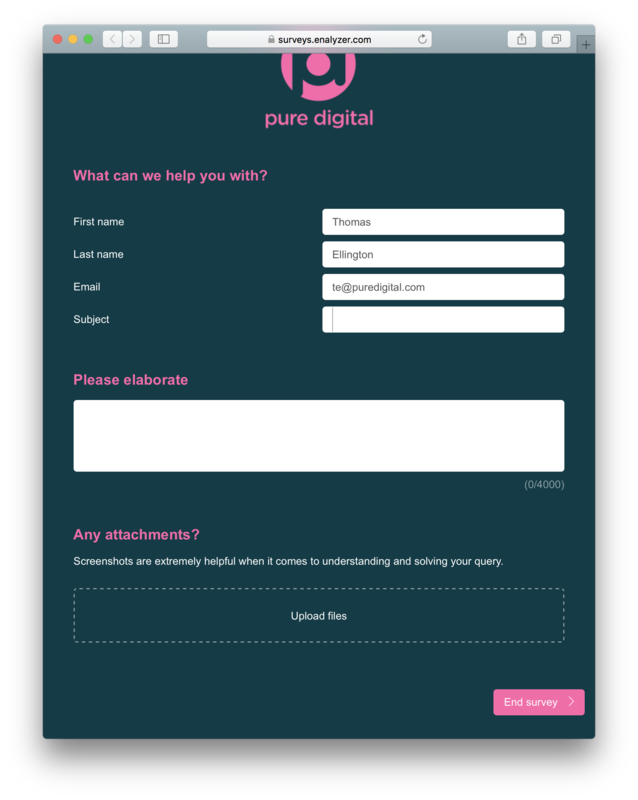 Newsletters and email marketing is a cost-effective way to do this, however, to deliver these you need a way to build and store a contact list. With Enalyzer, you can create a signup form for those interested in your content and have Zapier automatically add them to your email marketing app, such as MailChimp or Sendgrid. Webinars are an excellent way to get exposure, deliver quality free content and place your brand as the thought leader in your industry. Create a signup form with Enalyzer, and Zapier can automatically transfer new signups to a webinar app of your choice. By providing personalized and tailored content, you are letting potential customers know that you have the solutions to their problems and thus enter their evaluation stage. But how? Easy, the second someone enters your mailing list, Zapier sends them your Enalyzer survey. You can report on the feedback continuously and tailor your content to your audience’s interest and behavior. Feedback from sales meetings will help you identify early warning signs and areas with potential for improvement. By addressing these, you can increase sales while keeping your prospects and leads happy. Use Enalyzer’s Sales Meeting Evaluation template and customize the design to fit your brand. With Zapier, you can automatically transfer the responses to a messaging app or email service in real time! Enalyzer makes it simple to create powerful feedback forms and Zapier can take those responses and send them directly to your ticketing system or email. Now you only have to worry about providing excellent customer support. You can create a simple contact form with Enalyzer but instead of creating a database manually, Zapier can automatically store these leads in your preferred CRM system, such as Salesforce or even Google Sheets! 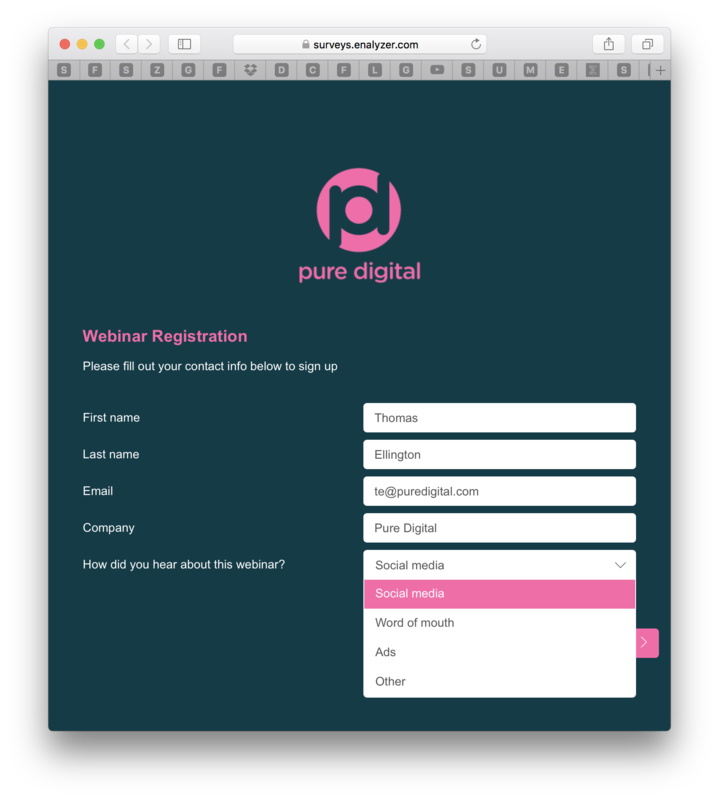 Keeping track of potential customers has never been easier. Make sure that your customers can order online from anywhere by creating an order form with Enalyzer. After setting up this automation, Zapier will automatically create a new order on your webshop, e.g. Shopify or Shipstation. It’s important that you understand your customer’s purchase experience in order to improve it and ensure loyalty in the future. Instead of figuring out the best time to send a survey, you can automize this process with Zapier. Create a feedback survey with Enalyzer and Zapier will send your survey after the customer purchase has gone through. To make it even better, you can add a delay step, so customer’s get the survey after they’ve received their purchase. The NPS metric is an effective metric to measure customer loyalty. Create an NPS survey using Enalyzer and connect your account with a messaging app via Zapier. This way, you can stay updated in real-time with your customers’ feedback and react immediately. However, don’t forget that with Enalyzer you can track your NPS over time, giving you a holistic idea of your customers’ loyalty development and progression. Once a customer has entered the loyalty loop, they will choose you again and again and even promote your brand to their network. Why not capitalize on that by spreading the good word to Twitter? Create a satisfaction survey with Enalyzer and Zapier will post the positive reviews to Twitter after they’ve been filtered through whatever criteria you define. Social media is powerful but don’t forget about review sites. Create a satisfaction survey with Enalyzer, and Zapier will send your customers an invitation to leave a review on Trustpilot or Feefo. This is an easy way to increase your reviews and improve awareness of your product.